Everyone seems to be throwing the word "botanicals" around at the moment, without quite understanding what it means. The dictionary defines it as plants and their derivatives used in medicine or cosmetics. Most chefs seem to think that it simply means throwing green stuff on top of every dish. But my favourite is the online Urban Dictionary, which defines botanicals as the logical result of drinking too much – as in "this whole situation is soooo #botanical". 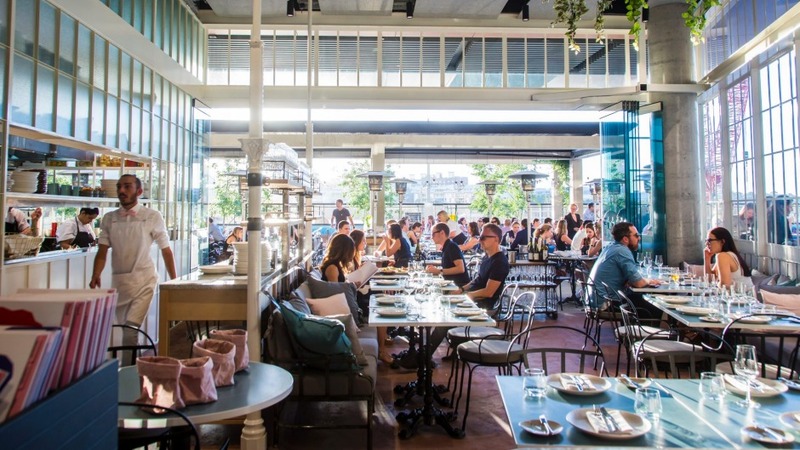 The new Banksii at Barangaroo is a legitimate attempt by Hamish Ingham and Rebecca Lines of Surry Hills' mod Asian Bar H to dig deep into the botanical garden. 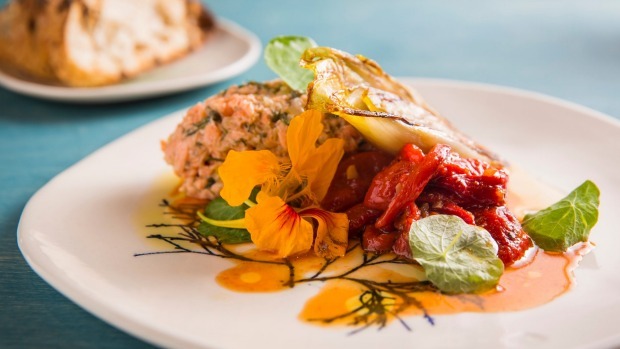 Named after First Fleet botanist Sir Joseph Banks, the 200-seater bar-restaurant has a big focus on right-on-trend vermouth, with 37 options, while the kitchen processes plant roots, leaves and flowers in a variety of marinades, sauces, and broths. Herbs, beach succulents, wild plants and flowers crown dishes like edible litter. Design team Luchetti Krelle has wrangled an industrial Parisian vibe, with the clean lines of a glass-walled bar and dining room spilling into a broad, open, and often blowy, front terrace. Lines leads you up the garden path with a lightly fragrant, crisp, dry rosé vermouth on the rocks made for Banksii by Victoria's Maidenii at an entry-level $5. Team it with crumbed sardines ($14), presented as six schnitzel fingers, next to a pool of glossy, smooth aioli. From a menu divided into small and large dishes comes ocean trout rillettes ($18), a pink mince of fresh and smoked fish, preserved lemon, dill, capers and creme fraiche that's just as moreish as the elegant ocean trout parfait at nearby Cirrus. 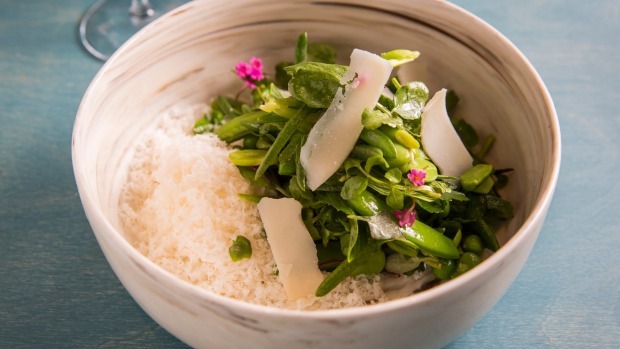 The right-here-right-now dish is a virulently green mix of double-shelled broad beans, young peas and cheese two ways – gratings of a caramelly, aged Dutch goat's milk cheese and a spoonful of fresh citrussy Meredith goat's curd – strewn with pink society garlic flowers. It tastes so seasonal as to be ephemeral, like a moment caught in time. Be warned: when Ingham suggests dishes are for sharing, he means it. The large dishes are indeed large, like the nicely glazed, slow-cooked, half Thirlmere duck with red vermouth-soaked plums that one couple struggles to finish. 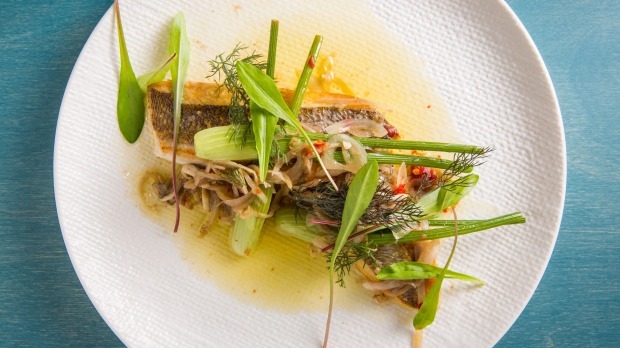 Seared snapper fillet ($36) sees two sizeable fillets of crisp-skinned fish, pimped with anchovy, preserved lemon and fermented chilli served under a highly compatible bush camouflage of fennel fronds, baby fennel and fresh dandelion leaves. Mussels come in two sizes, but even the smaller ($28 for 500 grams) is large. Smartly cooked in a white vermouth broth, they are finished with nettle butter and plump green olive cheeks in a lovely, buttery pool of greenery, excellent with a 2015 Huia pinot gris ($75) from the lively Euro-Oz wine list. 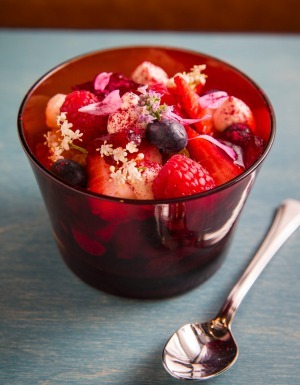 Trifle ($16) finishes things with a fresh flourish of berries, elderflowers, hibiscus (rosella) jelly and sponge softened in Italian Mancino vermouth. The jelly is the best bit, but then, jelly is always the best bit. With its casual breakfast, lunch and dinner hours, full-on flavours, and friendly, professional old-school/new-school service, Banksii is set to be a big drawcard for this new side of Sydney. Add the particular pleasures of the bar as well, and things are bound to get soooo #botanical. Best bit: Vermouth gets the star treatment. Worst bit: Can get nippy on the outdoor terrace. Go-to Dish: Broad bean, young pea, aged goat's cheese, $19.